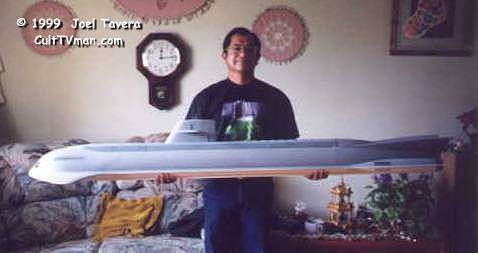 Here we have Joel Tavera showing off his current project…. Here are some PICS of the refurbished 81 inch DeBoer Hulls Seaview. I had to repair it due to damage incurred in the big earthquake we had in California a few years ago. The first PIC is of yours truly wearing his official “CultTVman” T-shirt showing off the repaired model. 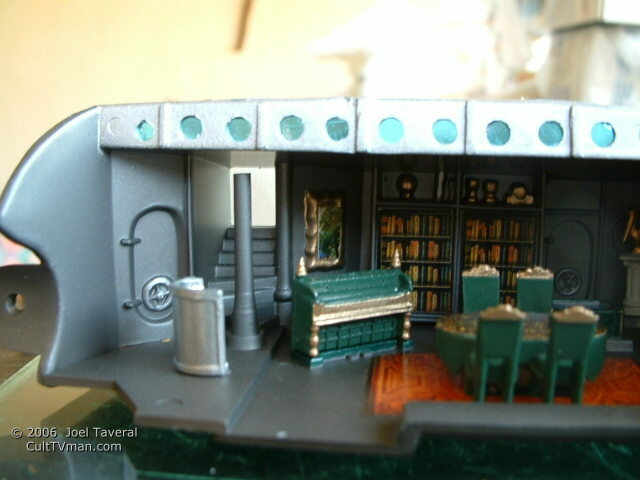 There is a detailed control room that I did previously for this model but it is not installed neither are the windows, nose and fin lights due to another person doing the lighting of this model. I just had no time to do the balance of it. The second PIC is of the happy “Mr. H” holding his precious model. I used a NAPA automotive primer for the hull from the can. I got a nice smooth finish and it dried real fast! Tamiya Neutral Grey was airbrushed from the bottle for all the missile hatches, stripes, doors and other detail. Picture number 3 has the delighted “Mr. H” showing the underside of his model. NAPA flat white was used for this area, however the paint went on very smoothly and turned out to be a semi-gloss which was a pleasant surprise. Since scale wasn’t a coloring factor for this big monster of a model I opted for this white rather than the camouflage Grey I usually use on smaller versions of the Seaview. The sail planes and the rudders are movable. I wish that I could get some clear shots of the detailed wells in the sail that I scratch built for “Mr. H’s” Seaview. I made a radar mast and a duplicate hatch to go into those wells that I constructed. From what I understand this larger version doesn’t come with those pieces. 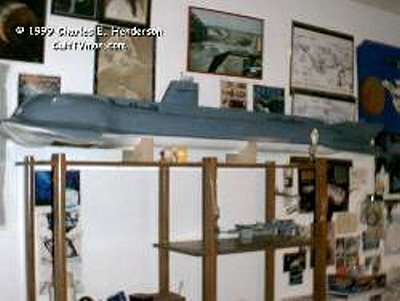 I am told by Dennis DeBoer that this model is now a rarity. 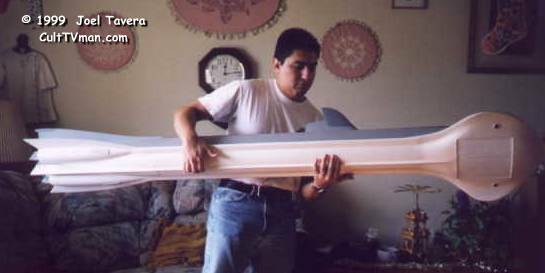 He won’t be manufacturing this model again. Then again he may change his mind in the future. Too bad! 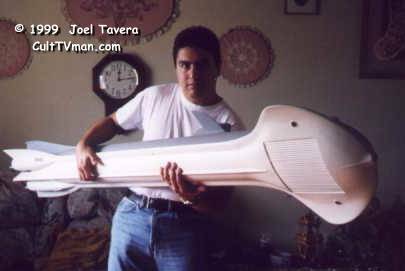 If I had won the LOTTO I would have purchased this model over his 57 inch one because it is of the 8 foot version which was designed a bit differently that the 16 foot one. I hope you all like this presentation and if any of you get a chance to acquire an 81 inch Seaview….GO FOR IT! it is worth it.